I was thinking of trying to run a game of MnM at a local con and thought i'd ask you guys for your experiences. Have you GMed/played in MnM games at cons? What have you run or would like to see run! I don't think MnM is very well known around here so I'd probably try for something simple, as much for myself as well since I don't have a ton of experience GMing. As for characters, I'm thinking of keeping away from full character-creation. Maybe pregenerated Marvel or DC heroes or using the Archetypes from the rulebook. Another option I'd like is doing something with the GMKit. A sort of guided characterbuilding if not full randomization. The other question is what to run. I might just try running something like Emerald City Knights, or maybe an adventure based on the Secret Wars if I decide to go with Marvel pregen characters. What do you guys think? No i haven't. Yes i would like to. We discussed this at some point on the forum, the idea of a "crisis on infinite gencons" kinda idea: The idea of running a superhero event game with 5 different tables, all running different games, but all linked into one main story... An the MVP of each table as voted by the players would move on to the final story part. Obviously thats well beyond what you are looking for. McGuffin wrote: I don't think MnM is very well known around here so I'd probably try for something simple, as much for myself as well since I don't have a ton of experience GMing. KISS is the rule of thumb with con games, especially opener games... Games designed specifically to draw in a new crowd. Generally you want to show case what the system can do while also showing how much fun it is to play. McGuffin wrote: As for characters, I'm thinking of keeping away from full character-creation. Maybe pregenerated Marvel or DC heroes or using the Archetypes from the rulebook. Another option I'd like is doing something with the GMKit. A sort of guided characterbuilding if not full randomization. I would councel the opposite of that point: Go with the full build pre-gen. The more memorable you can make the characters the better, the more iconic to the concept of superheroes with out becoming corny the better. Try to hit as many of the classic & contemporary ear marks of the genre as possible without making it convoluted or silly. While using the archetypes sounds like a good idea, they are actually really boring as characters, designed to show what you can do with the system, not what you SHOULD do with it. Plus designing PC's under 3E is fun & very relaxing... At least i've always found it relaxing. Plus if you design your characters first, you can then design the adventure to the strengths of the PC builds. If you've got a tech hero, a paragon, an energy blasters & a stealthy costumed adventurer, you've now got a framework to design your adventure around. You know you need a science challenge, a strength challenge, a stealth challenge & an esoteric energy challenge. It is also a great marker for how difficult things should be... If the highest technology skill is set at 30 (Skill rank 10 + maximum dice roll of 20), don't include DC40 alarm systems for example. Let me preface this by saying that I haven't run MnM at cons before or even played in a con game. So, take this as you will. I don't know how long you would have in the con for the game, but I would stick to something simple. Have pregenerated characters from the basic archetypes that are tweaked to make them fun to play without requiring in depth knowledge of the system. An Iron Man like battle suit, Superman like paragon, Flash like speedster, Wolverine type living weapon, etc are all simple enough ideas that people without prior knowledge of the system can relate to without being flat our clones of popular characters. When creating the characters, I would suggest leaving enough for the players to put their own fluff in on the fly. Also, the powers should be simple enough as to not bog the game down in nuances. Even if the players don't follow the rules perfectly, I would let some things slide to draw them into wanting to explore more of the game. As for the adventure, I would keep it simple and straight forward enough to be run in the time constraints while still providing lots of action and things for the players to do. For 3E, I can't give any specific examples because I have limited experience with it. A good example from 2E would be the bank robbery with the appropriate villain NPC's. It is a simple enough plot where heroes are called to the scene or one or two might be in the bank doing some banking, deal with the bad guys in the bank, bad guys make a break for it in a chase scene, and the heroes need to get into a hide out with security measures the players need to get through to apprehend the bad guys. All of the phases can be tailored to highlight the strengths of the various prebuilt characters. mrdent12 wrote: Let me preface this by saying that I haven't run MnM at cons before or even played in a con game. So, take this as you will. Oh you haven't lived until you've spent a small fortune on a small can of coke... Oh the convention prices, how you cheat us. mrdent12 wrote: I don't know how long you would have in the con for the game, but I would stick to something simple. On average 4 hours is a single game slot. mrdent12 wrote: Have pregenerated characters from the basic archetypes that are tweaked to make them fun to play without requiring in depth knowledge of the system. Even tweaking them can't really save those builds. I mean thats always an option, but if the goal is to run the best event you can, players have come to expect lovingly hand crafted PCs, no matter what the system is. Remember when it comes to con gaming you are pretty much in direct competition with everyone else running demo games. mrdent12 wrote: An Iron Man like battle suit, Superman like paragon, Flash like speedster, Wolverine type living weapon, etc are all simple enough ideas that people without prior knowledge of the system can relate to without being flat our clones of popular characters. mrdent12 wrote: When creating the characters, I would suggest leaving enough for the players to put their own fluff in on the fly. Its been my experience that its actually the opposite way round. While players very much want to do that in a campaign, in a demo/con game its been my experience that what they really want is to have you show up with everything they need to play with little to no fuss. They want to have a page in front of them that says "you are the square jawed paragon." Without that you get "Campaign Day One Syndrome." CDOS is that paradigm you get one the first day of a new campaign where players haven't quite figured out there characters eccentricities yet & there is no shared narrative for them to work on, so everyone sits around being kind of reserved. Thats why all the old RPGA non-living con games always use to have a section on each characters cheat sheet explaining there relationship to the other characters. mrdent12 wrote: Also, the powers should be simple enough as to not bog the game down in nuances. The thing about M&M 3E is that its simple enough to teach the basics in a couple of minutes. 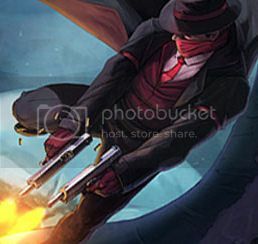 mrdent12 wrote: A good example from 2E would be the bank robbery with the appropriate villain NPC's. DO NOT DO THE BANK ROBBERY SCENARIO! I know it sounds like something easy but its played out. Mechanically its just a fight scene between super powered individuals, with little to no use of any other capabilities. Storytelling wise it gives players nothing to sink there teeth into. this one is more straight up combaty though. A couple of other good actual play podcasts on there for DCA/M&M 3E if you are interested. I will have to dig into 3E a little more than I have in the past. For some reason it never appealed to me too much, but if its as easy as you say it might be a spot of fun to try to run as a one off here to get a sense of the system. Thank you very much for your replies, you've given me plenty of food for thought. I especially liked the podcasts since I've been getting into listening to Actual Play sessions. Educational and entertaining. Luckily I've got a fair bit of time to work on this whole thing.